Five case studies profiling producers across the Colorado River Basin and beyond who are adapting and even thriving in the drought. This report was created in partnership with the Family Farm Alliance. 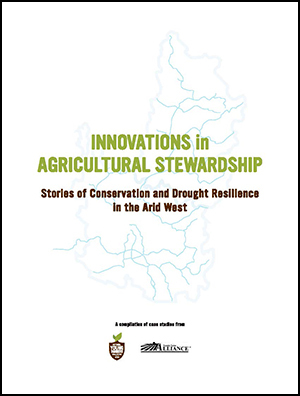 Innovations in Agricultural Stewardship: Stories of Conservation & Drought Resilience in the Arid West offers five case studies profiling producers across the Colorado River Basin and beyond who—with curiosity, creativity, and seasons of trial and error—are adapting and even thriving in the drought. This report was created in partnership with the Family Farm Alliance to highlight farmers who are building drought resilience, saving water, & growing good food for all of us. The West is mobilizing in search of answers to a growing water gap between water supply and demand. In order to develop smart policy, it is critical to understand the creative ways farmers and ranchers—young and seasoned alike—manage their land. They will—and already do—play a key role in finding innovative solutions that support the health of our land, water, and Western communities.